West Germany, 1978, 92 minutes, Colour. Ingrid Bergman, Liv Ullmann, Lena Nyman, Halvar Bjork. Ingmar Bergman is a genius with words and images. Here, preoccupied with painful memories, their lingering poison or their being irresponsibly ignored, he explores the hurtful relationship (tinged with love) between a celebrity mother and her talented but repressed daughter, not without hope for mercy. 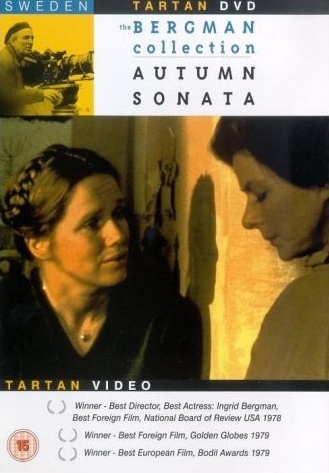 With Ingrid Bergman brilliant and Liv Ullmann perfect in their roles, the film is powerful material of joy, fears, rage and the chill of lost opportunities. Bergman has not had such opportunity for a wide range of moods, emotions and intelligent acting. Ullmann displays yet more facets of her ability. The film is heavy, there is a long night's journey of discussion into an elusive dawn. 1. The quality of Ingmar Bergman's films? Style, content, themes? Photography, production? Acting skills? The status of the two actresses? Audience expectations of their performances and interactions? Fulfilment? 2. Its place in the canon of Bergman film? Bergman in the '70s? At the age of 60? His insight, creativity, direction of leading actresses? Themes, humanity, hope? 3. The significance of the title and its indication of themes? Sonata, music, musical performance,' the type of musical composition? The season with its mellowness and bleakness? Age, regrets? A colder season, intimations of death? The winter has not yet come, that hope is not too late? 4. The choice of Norway as setting? The brief indications of exteriors, the beauty of lakes and mountains? The interiors and especially the world of the parsonage? The interior world of the characters? The contrast with the fixed world of Eva and the country parsonage? The contrast with the world of Charlotte, hospitals, car, train, continually in motion? Out of place in the stable world of the parsonage? 6. The structural framework of the film with Eva and her writing the two letters and what happened in between? The patterns of interaction between the two women, the classic confrontation at the Hour of the Wolf? The commentary of Viktor and his introduction and inviting the audience to understand Eva and what was to follow? His final reading of the second letter? 7. The focus on the Hour of the Wolf discussion? Its centrality to the whole film? Its length, the verbal content and dramatics, the feeling behind it, the visuals of a discussion between two women during the night? Intellectual, cinematic? 8. The introduction to Viktor as the guide for what was to happen? An objective reference for the subjective reactions of the two women? The impact of his explaining the situation to the audience and inviting us to look? His information about Eva's background - her health, living with the doctor, the breaking of the engagement, her work as a journalist, the marriage, the suitability of the room to live in, her books and the quotation about the practising of living? The transition to the personality of Eva, the tone of her letter, her relationship with her husband as parson and her deference to him, her relationship to Charlotte, her relationship to Helena? The contrast with Viktor's welcoming of Charlotte, his kindness towards Helena, his overhearing part of the discussion of the Hour of the Wolf, his final inability to cope with Helena, his reading of the letter and our assessing the reactions of the two women through his reaction? 9. The flashbacks as indicators of the characters of the two women: Charlotte and her memories of Leonardo, the fact of their relationship, her care of him, her story of her experience at his bedside, the matter-of-fact presentation of these memories? The contrast with Eva's flashbacks and fantasy, imagination, angle shots, light and shadow, haze? The importance of her father, her uncle, the unhappiness, the haze of memory and the subjective understanding? The place of Lena in these memories? Her mother and her piano-playing, her rejection? Eva's linking of her memories with the characters and her blaming of them? 10. The importance of children, the effect of the abortion on Eva, her mother's advice? Erik and his death and Eva's lamentation and silent walks by the lake? 11. The importance of Lena as a catalyst for the reactions of the two women? The audience introduction to her - fear of the retarded woman, her disabilities, her helplessness? Audiences sharing Charlotte's distaste, her acting the part, trying to say the right word yet being afraid and wanting to leave, the gift of the watch? Audiences sharing Eva’s communication with Lena and her happiness in watching Lena communicate with her mother? The importance of the background of Lena’s birth, gradual illness, her mother's neglect, the hospitalisation, her return to the parsonage, Charlotte's ignorance of what had happened to Lena? Her wanting to forget her? The importance of Lena's waking during the important night, her struggling out of bed and across the floor while her mother and sister fought? The final trying to communicate with Viktor? The character of Lena in herself, a sign of contradiction in revealing the realities of the two women? 12. The importance of the letter, the preparation of the room for Charlotte's arrival, the hopes, the absence of seven years, the car arriving, the well dressed elderly woman, her chatter, her impact on her daughter, the loving communication, the talk and the memories of Leonardo, the looking around the house, Eva's suddenly confronting her mother with Charlotte and the change that happened then and the change in tone of the visit? Could it have been a successful and happy visit or not? 13. Eva and the latent nastiness, its beginning to erupt, her fears and anticipation of her mother's visit, the impact of her memories and hatred.. confronting her mother with Lena, the discussion about the dress (and her mother confounding her expectations with the red dress? ), the meal, the discussions about the piano, her performance of Chopin and the clash? Charlotte's watching her daughter, her flinching, appreciating, being challenged to interpret and to perform? 14. Charlotte and Ingrid Bergman's style, the background of her career, her skills, her talk, her skill in playing the piano. the phone call with Paul and switching languages, an international celebrity, the bookings, her listening to Eva? 15. The real character of Charlotte? Her living a superficial kind of life and yet her artistry.. the basis of her talk, her devotion to Leonardo, her coping with Lena.. her surmises about her daughter's intention, the decision about the dress. her charm with Viktor, her manner with Paul. her insights into Chopin? 16. Liv Ullmann's interpretation of Eva? Her appearance.. presence, her primped presentation of herself, indications of suppression, her like and dislike of her mother, her taunting her, baiting her, the build-up to the arguments as indicated with the confrontation with Lena. the discussion about Chopin? 17. The build up to the night, Charlotte and the nightmare, her poise being shattered? Eva's anxiety and concern for her mother, her arrival? Their sharing the wine together? The night, the hour, the possibility of truth, being revealed? 18. The significance of the long discussion, the talk, the movement, the use of close-ups and profiles, the rhythms of the conversation and clashes, the ebbs and flows of the emotions? Eva's attack and Charlotte's defence? Eva and her memories of the past, the attitudes of blame, the bitter memories, their not being healed, the hatred? Her love for her mother, her dislike for her mother's lovers, her eight-month absence? Her own emotions, memories of Lena and blaming her mother for Lena’s illness? The accusations of her being an emotional cripple? Of her running away? Of her father's pain? The memory of her refusal to listen to her daughter after her practice and hide behind the paper? Eva's unhappiness, her reliving her childhood and the effect on her? 19. Charlotte and the shock of this revelation, the emotional hurt, her coming back, her trying to justify herself, trying to find reasons, her interpretations of the events that Eva recalled/ her insight into Eva's demands, her being frightened of her daughter and unable to cope? 20. The abortion issue and its repercussions? Eva's final blame and Charlotte's helplessness to explain? 21. How necessary was it for Eva to get out her hatred? Would she be able to cope? Was it necessary to be so harsh with her mother? To unmask her mother? Charlotte's asking for forgiveness and Eva's hard face and her refusal by lack of speaking? 22. The dramatic impact of the sudden transition to the train? The audience coping with what had happened? The lack of forgiveness, the lost moment? The significance of Charlotte having been unmasked and her chatter to Paul and her putting on the mask again? Her attitude towards Eva and blame? 23. Eva's walk, her trying to assess the situation, her grief for her child? Viktor and his trying to cope with Lena? 24. The decision to write another letter? The repetition of the opening? Eva saying that her mother perhaps would not read it? The device of the time shuffle and the showing of the faces of the two women? 25. The possibility of mercy, forgiveness? Eva's admitting that her hatred was childish and that she was still demanding? Charlotte reading this ?interpreting it as forgiveness and reconciliation? 26. The humanity of the characterisation, the themes of two charactered and family clashes? Insight into family, relationship, hurt? Age? Time and the festering of hatred, the need for forgiveness and healing? The hope and mercy indicated at the end?